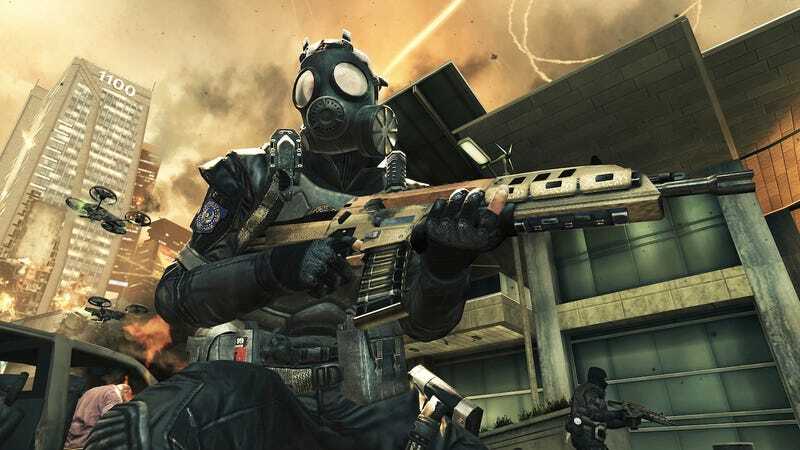 Call of Duty was always popular, but became a cultural phenomenon only in 2007 thanks to a revised multiplayer system that hooked players with a then-innovative ability-unlocking level-based system. That year's Call of Duty IV: Modern Warfare became the new GoldenEye, the new Halo... the new multiplayer game that it seemed like everyone who had a console was playing. Call of Duty multiplayer has become only more popular, now stretching new games of in the series into nine-month-long multiplayer-based "seasons" of new map packs and competitions. So why, I asked the head of the studio behind this year's Call of Duty: Black Ops 2, are you even bothering with a single-player campaign? Couldn't you just skip that and still be huge? "We want to create a campaign," Treyarch studio chief Mark Lamia said. "We have a whole team that's focused on creating the campaign. It's what we do. It's what we want to create. We want to create a campaign, multiplayer and zombies." Surely there's a business reason, too. Not everyone connects their consoles online, some people (me!) predominantly play the campaign, but I figured this was a good thought experiment at least—and a good test to see if one of the masters of the franchise would bite on the suggestion that Call of Duty could thrive without its story mode. Lamia doesn't sound like a guy who could picture a blockbuster CoD without a campaign. He sees it as being a crucial third of the experience, along with his studio's co-op zombies modes and traditional franchise multiplayer. "Those all cater to different emotional states," he said. "When you're playing the campaign, you're sitting down to have that sort of epic and cinematic experience, right? You want to have that first-person role in that experience. But multiplayer is all about that competitive and social experience." Black Ops 2 will have a campaign, of course, one that mostly depicts a near-future cold war instigated by a villain named Raul Menendez who turns the United States' high-tech arsenal of drones and future weapons against itself. "As creators we wanted to do something new inside the campaign structure," Lamia said, "and make the game play new and unique too and make it something that if you failed, the story would progress and note that you failed." Yes, they're adding failure to CoD campaigns, and, believe it or not, multiple endings. Yes, they're adding failure to CoD campaigns, and, believe it or not, multiple endings. The failures will be part of the game's unusual new Strike Force mode, which lets players step outside the boots of the game's protagonist David Mason and into the role of black ops squads who must fight proxy wars around the world. You play these missions as a commander and as any of the soldiers, hopping from one to the next as they die. If you fail one of these missions you can try it again, but there will be consequences. "It will actually affect the dynamics of that cold war," Lamia said. He wouldn't explain just how it changes the game, whether it locks off campaign missions, makes the game tougher or what have you. "It doesn't affect difficulty per se," he said, "but it will affect what you experience. It's meant to add non-linearity." Strike Force adds an interesting wrinkle and argues for the relevance of a Call of Duty campaign. Hell, any sign of innovation on that front does. Just don't expect another trend to infiltrate the campaign. It won't be playable co-op. "For Black Ops 2 and the kind of narrative we're telling it doesn't lend itself well to that sort of situation in terms of creating a co-op campaign," Lamia said. "It was a similar decision point that we made when we were creating Black Ops. It's not a question of technology. We made a game [Treyarch's Call of Duty: World at War] that has that, so we're capable of doing that. It's more about what we're trying to create inside the campaign. We put all of the emphasis about co-op into zombies." We'll have more on Black Ops 2 soon. The game will be out this November.